There is just one question you have to ask yourself. And it's not why should you attend the Total Customer Experience Leaders Summit in 2013. It's what you will miss if you don't. 1. 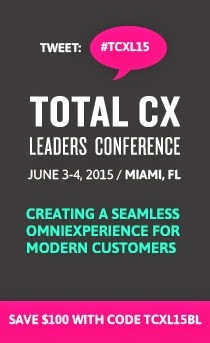 A Holistic Approach to Customer Experience from a Diverse Cross-Industry Speaker Roster. There is no other event that brings together higher-level thinking around the alignment of customer strategy with business relevant aspirations. Gain perspectives and cross-industry learnings from financial services, government, automotive, travel, retail, healthcare, hospitality companies and more. 2. Inspiring Keynotes. Hear from client-side experts and award winning authors on the power of listening and valuing customer feedback (Nationwide), understanding the emotional story (Sensory Logic), the impact of Big Data (American Express), optimize customer experience through social media (Facebook), transforming company culture (Safelite AutoGlass), how ethnographic methods are applied to design research (Pacific Ethnography Company), VOC integration (Maritz Research) and more. 3. Innovative Case Study Presentations. Customer-focused leaders share their insights-rich stories on designing a mobile app that motivates (JetBlue), developing a total customer experience metric (Toyota Financial Services), behavioral economics (GfK), creating unparalleled customer experiences (Eli Lilly & Company), optimize customer panels for instant VOC (CVS Caremark), Emart: global retail perspectives (Prophet) and more. 4. One Collaborative Congress. This high-engagement three-day experience focuses on expertise and interactivity with an integrated experience of all main stage presenters. Developing a balanced agenda on topics to help you advance your organization with a sound customer plan. Customer Experience Design - Explore how VOC data and design principles can be used to engineer experiences across your organization. Measurement & Feedback - Drive change and optimize your sales force by measuring customer feedback through the entire customer journey. Alignment - Integrate and leverage your customer touchpoints - measurement & ROI, linkage, VOC, social media, technology, design principles, operational metrics and senior leadership. 5. Executive Summary. Delivered to you after the event summarizing the key session highlights and game changing trends - a valuable resources as you craft your insights-rich customer story. "This event is about leveraging great customer research by linking and aligning it with key organizational issues. "- Bill Barnes, Senior Vice President, Burke, Inc. The Total Customer Experience Leaders Summit will give you the insights and skills necessary to make your customer programs a success. Find out how creating a customer-centric culture within your organization, through expanded leadership and employee engagement can drive business results.